James Barron was an officer in the United States Navy. He served in the Quasi War, the Barbary Wars, during which time he commanded a number of famous ships, including the USS Essex and the USS President. As Commander of the frigate USS Chesapeake, he was court-martialed for his actions in 1807, which led to the surrender of his ship to the British. After criticism from some fellow officers, the resulting controversy led Barron to a duel with Stephen Decatur, one of the officers who presided over his court-martial. Suspended from command, he pursued commercial interests in Europe during the War of 1812. 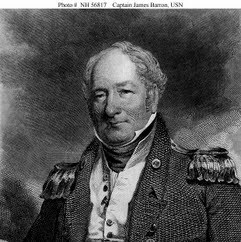 Barron finished his naval career on shore duty, becoming the Navy's senior officer in 1839.